Napoleon and his staff are returning from Soissons after the battle of Laon. 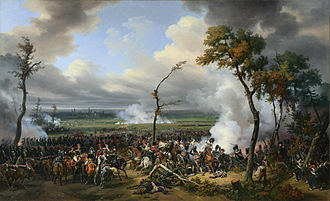 The Battle of Laon (9–10 March 1814) was the victory of Blücher's Prussian army over Napoleon's French army near Laon. An Allied coalition attempted to complete the destruction of Napoleon's French Empire in 1814. 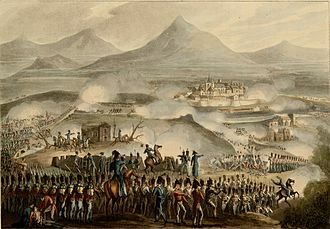 France had been defeated in Russia in 1812 and in Central Europe in 1813. 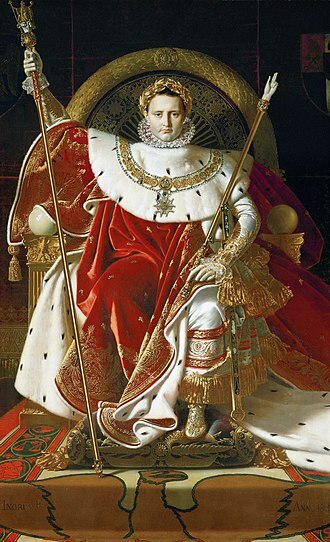 Napoleon's French Empire was now fighting for its survival. 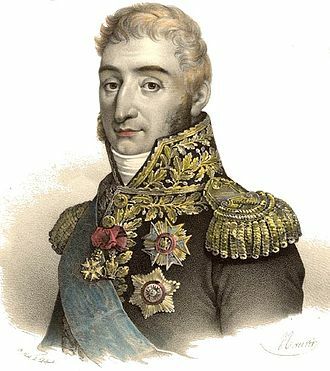 In the last week of February 1814, about a month after the start of the Allied invasion, Blücher seized the initiative and advanced on Paris with his forces. 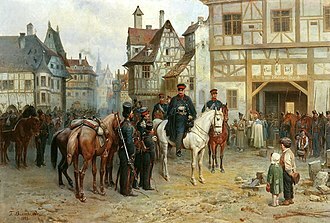 Napoleon's two marshals in the immediate vicinity, Édouard Mortier and Auguste Marmont, were covering the city with two detached corps, but they only had 10,000 men and would be unable to hold out against Blücher's larger force. Napoleon hurried westwards to their rescue with around 30,000 troops, hoping to trap Blücher against the Marne river. 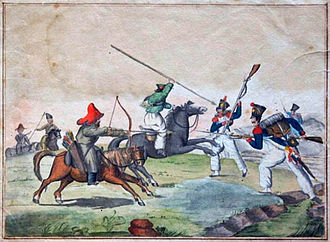 Blücher unsuccessfully attacked Marmont and Mortier along the Ourcq river in late February and early March and ordered a retreat north to regroup when he heard of Napoleon's advance. Prussian troops crossed the swollen Aisne river and arrived at Soissons on 4 March. There they linked up with reinforcements that brought Blücher's total force to 100,000. 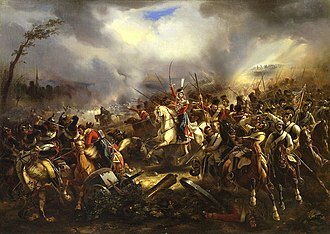 On 7 March, a clash ensued at the Battle of Craonne as Napoleon attacked westwards along the Chemin des Dames (literally, the "ladies' path"). Blücher's outflanking maneuver did not materialize in time and the Prussians were forced to withdraw towards Laon. Blücher chose to fight at Laon because it was an important road junction with a superb defensive position. 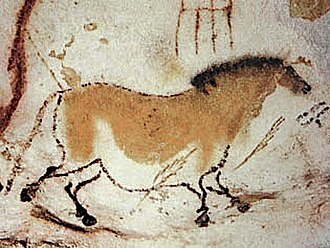 Laon was located on a flat-topped hill with steep slopes that rose 330 feet above the surrounding area. The countryside to the north was flat and open, but the south contained rough and wooded terrain that made military maneuvers difficult. 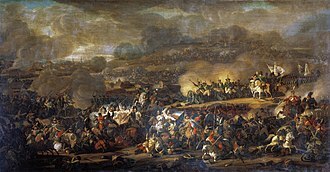 The villages of Ardon and Semilly at the foot of the hill served as good bastions for the Prussian and Russian forces. Blücher now had about 90,000 troops and 176 guns. 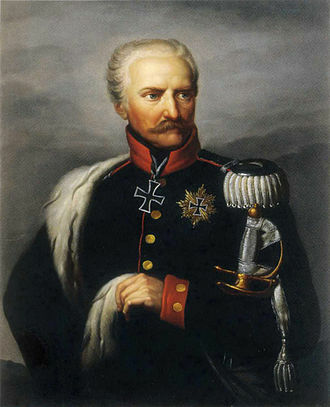 Friedrich Wilhelm Freiherr von Bülow's Prussian corps was assigned the defense of Laon itself. Blücher's western wing was covered by a Russian corps under Ferdinand von Wintzingerode while the eastern wing was defended by two Prussian corps under Generals Yorck and Kleist. Two Russian corps under Generals Langeron and Osten-Sacken stood in reserve. 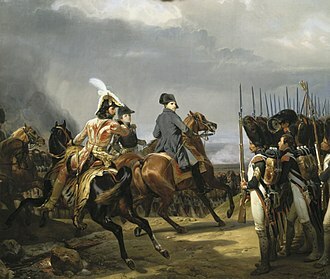 After Craonne, Napoleon had taken the bulk of his forces northeastwards towards Laon while detaching about 10,000 troops under Marmont to advance on Laon via the Berry-au-Bac road. Preliminary fighting on the evening of 8 March saw the French vanguard chase off a small Russian detachment from the village of Urcel on the Soissons road. In the early hours of 9 March, the French renewed their push along the road. At 5:30 a.m., French dragoons arrived in front of Laon, but had lost the element of surprise and withdrew under heavy fire. From 7:00 a.m. onwards, the French repeatedly attacked the Allied positions at Ardon and Semilly. Some troops from the Young Guard even reached the top of the hill before being driven back. Blücher was suffering from a fever and could not direct affairs as closely as he was accustomed during previous engagements. By 11:00 a.m., however, the fog had lifted and the Allied command staff had a clear view of the battlefield below. 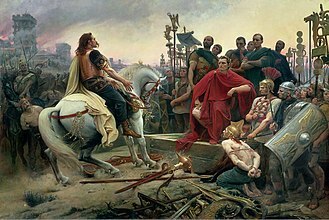 Blücher, because of poor intelligence sources, was operating under the impression that the French had 90,000 troops and was generally reluctant to have his troops launch any attacks. 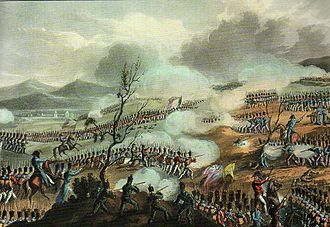 The Allies might have scored a decisive victory had they launched a full attack against Napoleon's 30,000 men, but the uncertainty about the situation led Blücher to commit only Winzingerode's corps against Napoleon's left flank. Winzingerode's attacks were feeble and easily repulsed by the French. Blücher now decided to isolate Napoleon's western forces from Marmont's column to the east. A convincing Allied attack captured the village of Ardon, but the victorious Prussian infantry brigade was ordered to halt because Blücher feared that French forces to the east would outflank them. Renewed French assaults late in the evening of the 9th led to the capture of Clacy, a village on Blücher's western flank. By the end of the first day of fighting, however, Laon still remained in Allied hands. Meanwhile, at around 5:00 p.m. on 9 March, Marmont's troops had attacked the village of Athies and driven off the Prussian advanced units. Marmont then sent 1,000 men under Colonel Fabvier westerwards to establish contact with Napoleon's main army. Blücher and Gneisenau (Blücher's chief-of-staff) heard the fighting to the east and ordered a powerful counter-attack with two corps. The Allies slammed into Marmont's troops and drove them back. Marmont was saved by Colonel Charles Nicolas Fabvier, who returned on his own initiative with 1,000 troops to clear the road, and by 125 veterans of the Old Guard, who repelled the Allied cavalry trying to block the French from escaping. Marmont had taken a bad beating, losing 3,500 men and 45 guns. At midnight on the 10th, Blücher decided on a bold outflanking maneuver intended to crush the French. He was even more ill on the 10th (Gneisenau was effectively in command), but the army still defended Laon. A few more French attacks throughout the day produced no results, and Napoleon retired his forces late at night. 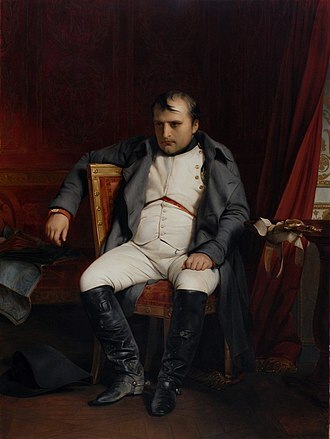 This setback did not by itself spell the end for Napoleon. Just a few days later the French crushed an isolated enemy corps at Rheims. Blücher's Army of Silesia remained inactive for a week after the victory. 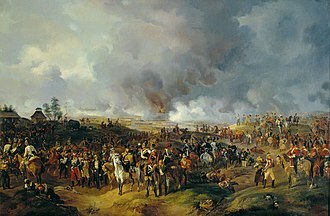 Nevertheless, the Allied stand had prevented Napoleon from driving them further north. The Allies were still in a position to advance on Paris, which they did at the end of March. ^ Uffindell 2003, p. 203. ^ a b c d Uffindell 2003, p. 201. ^ Uffindell 2003, p. 207. ^ Chandler 1995, p. 991. ^ a b Uffindell 2003, p. 198. ^ Uffindell 2003, p. 200. ^ Uffindell 2003, p. 205. ^ Uffindell 2003, p. 206. August Wilhelm Antonius Graf Neidhardt von Gneisenau was a Prussian field marshal. He was a prominent figure in the reform of the Prussian military, Gneisenau was born at Schildau in the Electorate of Saxony. He was the son of a Saxon lieutenant of artillery, August William Neidhardt and he grew up in great poverty at Schildau, and subsequently at Würzburg and Erfurt. In 1777 he entered the University of Erfurt, but two joined an Austrian regiment quartered there. 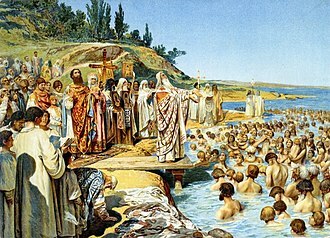 In 1782, taking the name of Gneisenau from some lost estates of his family in Austria. 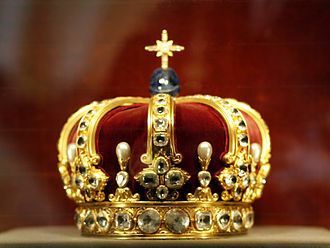 With one of that princes mercenary regiments in British pay, he saw active service, returning in 1786, he applied for Prussian service, and King Frederick the Great gave him a commission as first lieutenant in the infantry. Made Stabskapitän in 1790, Gneisenau served in Poland from 1793-1794, ten years of subsequent quiet garrison life in Jauer enabled him to undertake wide ranging studies of military and political history. 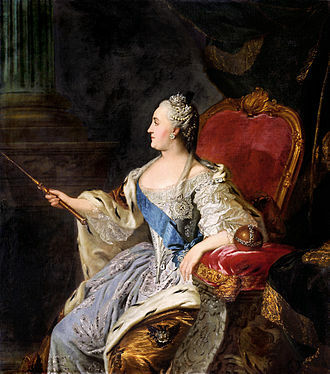 In 1796 he married Caroline von Kottwitz, the commandant received the highly prized Pour le Mérite and promotion to lieutenant-colonel. A wider sphere of work now opened to Gneisenau, as chief of engineers, and a member of the reorganizing committee, he played a great part, along with Scharnhorst, in the work of reconstructing the Prussian army. Though primarily devoted to the problem of military reorganization, he exercised influence on the general policy of the Ministry as well. A colonel in 1809, he drew upon himself, by his energy, the suspicion of the dominant French. 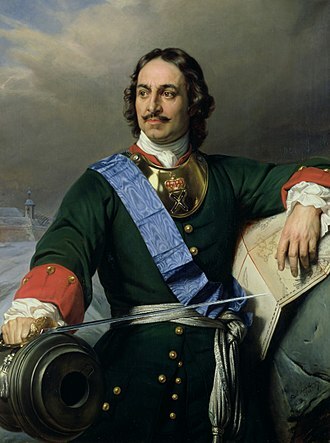 But after visiting Austria, Imperial Russia and England on secret missions, he returned to Berlin, thus began the connection between these two soldiers which has furnished military history with one of the best examples of harmonious co-operation between a commander and his chief-of-staff. 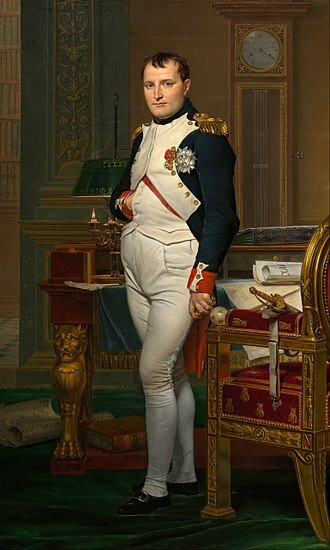 The plan for the march on Paris, which led directly to the abdication of Napoleon in April 1814, was specifically the work of the chief-of-staff. In 1814, as a reward for his service, Gneisenau — along with Yorck, Kleist. In 1815, once more chief of Blüchers staff, Gneisenau played a conspicuous part in the Waterloo campaign of June/July 1815.